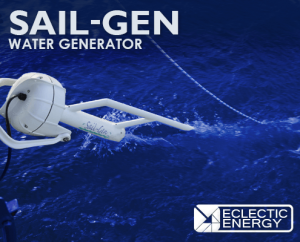 The Sail-Gen is a dedicated water generator developed for the long distance sailing. It shares the same operating principal as the DuoGen’s water mode, which is well proven over hundreds of thousands of sea miles. The Sail-Gen comprises a rigid welded aluminium frame with carbon fibre drive shaft and cast alloy impeller. It is compact in size and both reliable and efficient in operation. At typical passage speeds (5 – 6 knots) the Sail-Gen is capable of matching the power consumption on many cruising yachts meaning that the batteries remain well charged. 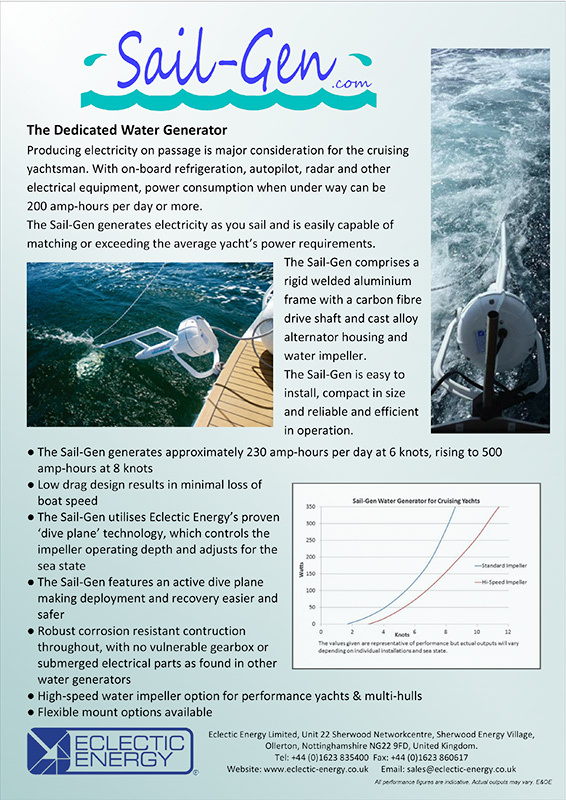 The Sail-Gen is also extremely easy to deploy and recover and is quiet in operation. ● The Sail-Gen is direct-drive, i.e. 1:1 ratio impeller to alternator. There is no gearbox to wear and add friction. ● The Sail-Gen’s alternator is not submerged, and is therefore less liable to failure through water ingress. ● The Sail-Gen’s running depth is controlled by a ‘hydro foil’ or ‘dive plane’. This means that the water impeller flies through the wave action at a constant depth and is not directly affected by the pitching movement of the yacht, as occurs with the ‘outboard leg’ type generator. ● The impeller running depth can be optimised by a simple adjustment of the dive plane angle. ● The dive plane prevents the water impeller from surfacing in all but the most extreme situations. ● The Sail-Gen dive plane is active, and moves to a positive angle as tension is applied to the recovery lanyard. This makes recovery simple and easy, regardless of boat speed. *All performance figures are indicative. Actual outputs may vary. E&OE. If possible, install the Sail-Gen when the yacht is ashore. If this not practicable, installing in a marina with the yacht secured stern to a pontoon is a good alternative. The pontoon provides a safe and convenient working platform. A dinghy can be lashed across the transom in order to provide additional security, if work has to be done at anchor. The Sail-Gen is built from high quality and corrosion-resistant materials. The unit is designed to require minimal maintenance, but a little attention will pay dividends in terms of appearance and performance. The alternator requires no routine maintenance and is hermetically sealed. The alternator is fitted with rubber-shielded, stainless steel bearings which are protected by a twin lip, radial shaft seal. A dry-running spherical, self-aligning bearing is fitted at the top of the tower. Elsewhere, dry-running bearing bushes are used. The water impeller unit utilises a specially designed transmission which presents the impeller perpendicular to the water flow. The transmission element is robust and maintenance free. It is lubricated by a combination of synthetic oil held within the bearing material itself and water. When dry following immersion in seawater, the unit may feel stiff. This stiffness is usually due to dried salt deposits and the drive should free up when the unit is returned to the water. 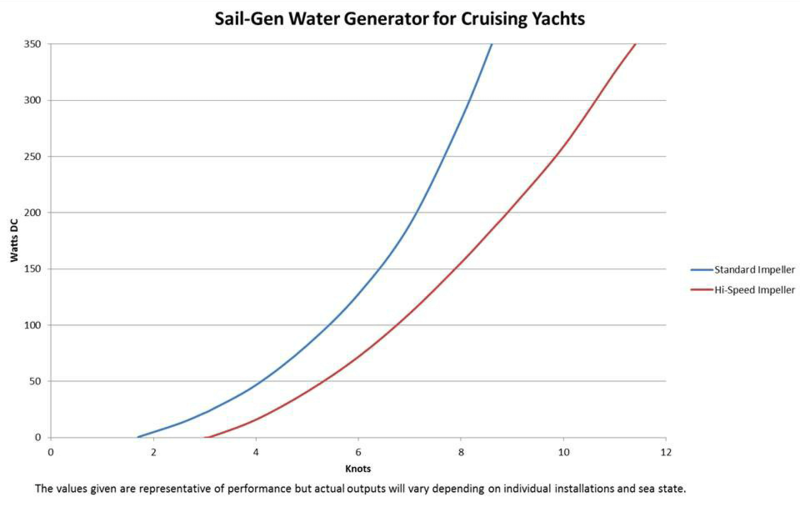 The Sail-Gen’s water impeller rotates about 5 million times for every thousand miles sailed, and like all mechanical devices, the water transmission is prone to wear. Eclectic Energy recommends that the transmission elements are replaced every 8 – 10,000 nautical miles, after approximately 40 – 50 million revolutions, in order to maintain optimum performance. This is a straightforward procedure that can be undertaken by the owner. 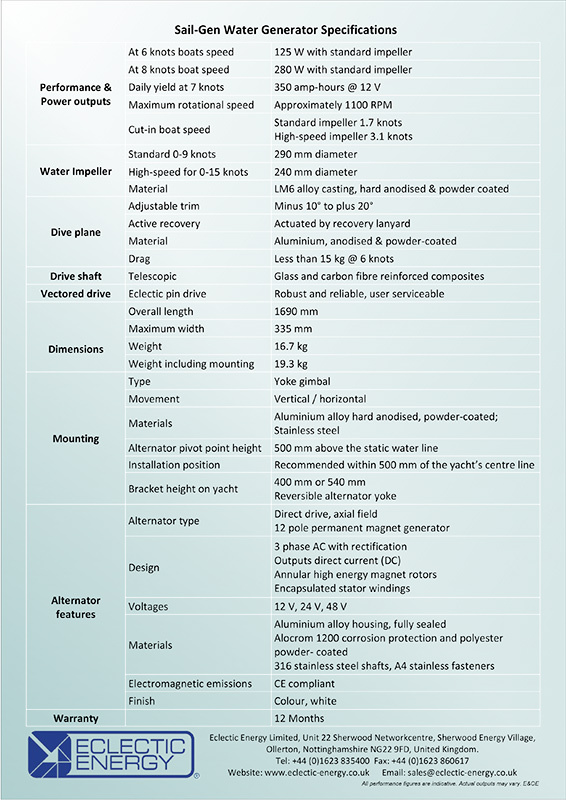 A full range of spare parts are available for the Sail-Gen in our Shop section under Sail-Gen Parts. All spare parts are supplied with fitting instructions.